Every keen cyclist can name several legendary cols of the Tour de France. You know the famous climbs in the Alps, the Pyrenees and the Mont Ventoux, the giant of the Provence. Perhaps you have already done them. But sometimes when you watch the Tour on television, you think : "Where is that col?". "I don't know that climb". France has much more to offer, than only the "big" well-known names. A large part of the country is rolling, hilly or mountainous. Cols and côtes everywhere. A Dutch foundation started in 1979 an initiative to link a large number of climbs in France together and called it : "The 100 Cols Tour". The route has undergone several changes over the years to make the tour more attractive and more challenging. The foundation uses two captions in their description of the tour "it's the toughest bicycle tour in the world" and "it's also the most beautiful bicycle tour in the world". The route is a succession of wonderful landscapes, quiet nature parks, little picturesque villages, stunning views, and of course countless little côtes and challenging cols. 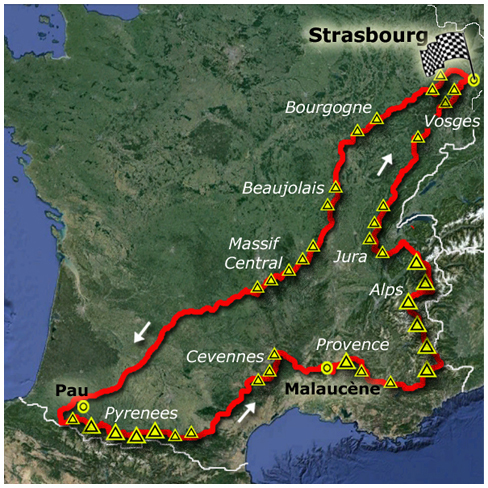 We start our tour near Strasbourg, in the north western point of the loop. We climb some little cols in the Vosges before we make a diagonal crossing through France. Via the Beaujolais region and the Massif Central we end up in the Basque provinces near the Spanish border. All major Pyrenees cols are waiting. The highest of the Cevennes, Mont Aigoual, and the highest of the Provence, the Mont Ventoux, are of course part of the tour. It are not only the highest cols which we pass, also many other, less known, cols are included throughout the entire tour. The famous cols in the Alps bring us to altitudes far above 2.000 meter which guarantees splendid views. We head further north through the Jura including the wonderful hairpin climb of the Grand Colombier. And the tour isn't complete before we have done the Grand Ballon and the Ballon d'Ascase in the Vosges. Not one single flat boring stage. The 2nd edition of the "100 Cols" starts Saturday May 9th, 2020 near Strasbourg. The finish is 40 days later and after 4.200 challenging kilometres at the same location. A real "Tour de France". The whole tour has been divided into three main sections, so that you can choose to cycle all cols in (1) the Beaujolais and Massif Central, (2) the Pyrenees and Cevennes, or (3) the Provence, Alps, Jura and Vosges. The whole route follows good paved and quiet back roads. The course rolls everywhere. From little hills in the centre of France, to long, steep climbs in the Pyrenees and the Alps. You are rewarded each time with a fabulous descent, before the next climb is coming up. The tour is held in the beginning of summer, which means that we expect warm, beautiful sunny days, but keep in mind : rain is always possible and the weather conditions can become heroic if we reach altitudes above 2.000 metres. If you want them all, you can get them all. The credo of Bike Dreams is : "Life is not the dreams you have, but the dreams you realize". Request the Brochure of "100 Cols"
The "100 Cols Tour" is created by Honderd Cols Tocht, a non-profit organization dedicated to inspiring people to cycle through all great mountain areas of France. For more information, please visit their website "De Honderd Cols Tocht".